Inspired by the kathy ireland Home Architectural Style Guide, Fulton is a soft modern collection that blends traditional design elements like crown molding and picture frame detailing with contemporary influences like clean lines, satin nickel hardware and a rich multi-step, hand applied espresso finish. Bring the best of both design worlds in to your home with the Fulton home office collection, a true design solution for living. 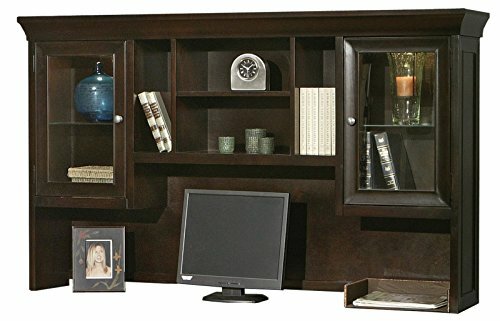 The hutch features glass doors with adjustable shelves, a center storage compartment, and a touch activated light system. Ships fully assembled with 5 Year manufacturer warranty.